Three hours south of Bangkok, along the edge of an expansive wetland, sits a mid-century modern house. While the term ‘mid-century modern’ and a warm, tropical setting aren’t typically associated, Bangkok-based architectural design studio Sunday* Architects’ latest project is a distinctive testament to the movement. 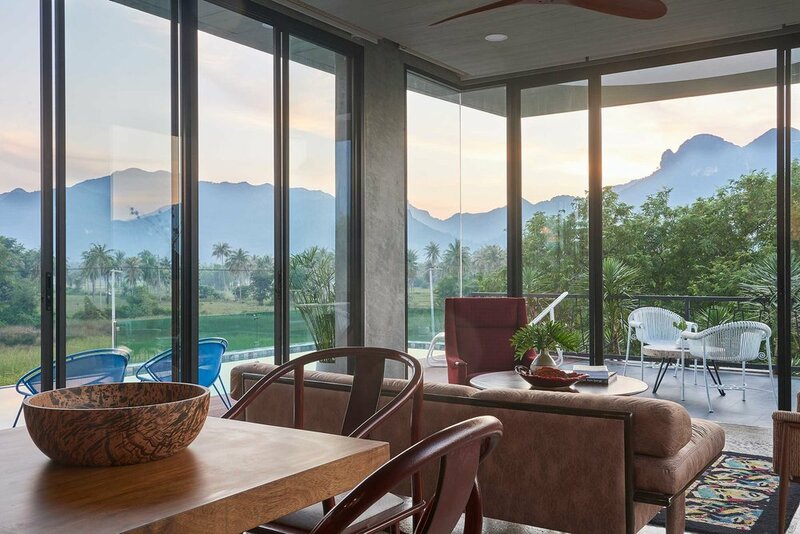 ‘In Southeast Asia, it’s rare to see mid-century design in resorts and homes; it’s not as appreciated here as it is in other parts of the world. In fact, many such homes in Bangkok’s Sukhumvit and Ekkamai areas have been knocked down to make way for new high rise condominiums or restaurants,’ explains the studio’s co-founder and director Saran Chaiyasuta. In this context, and thanks to the clients’ unconventional brief and their existing collection of mid-century objects and furnishings, the home is a delightful departure from the norm. Nevertheless, the home appears to have been plucked straight from 1960’s Bangkok, which is exactly what the owner was hoping for. 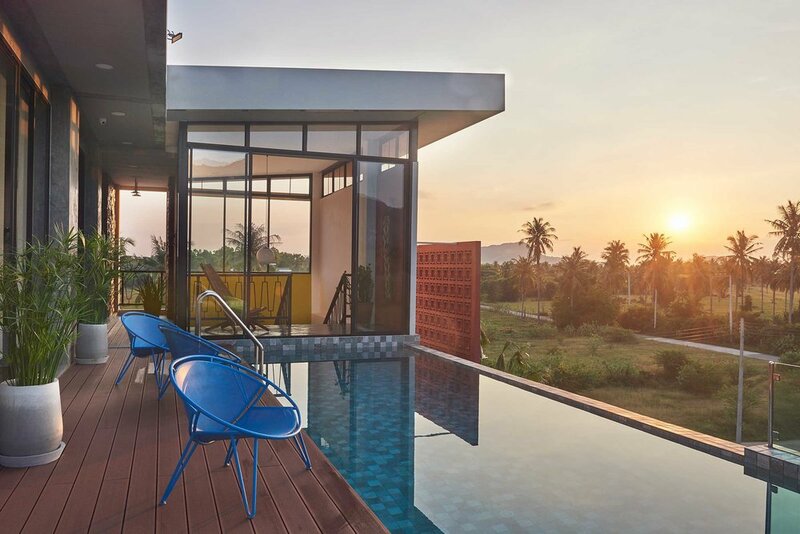 With a brief based around the client’s mid-century childhood home in the Thai capital, the architects responded with a three-bedroom property that embraces elements of mid-century modern design, from natural materials with contrasting graphic patterns to vibrant colourways and selective furnishings. The focal point of the building is a rooftop clubhouse. Here, the open floor plan comprises a kitchen, bar, dining room and casual living room. 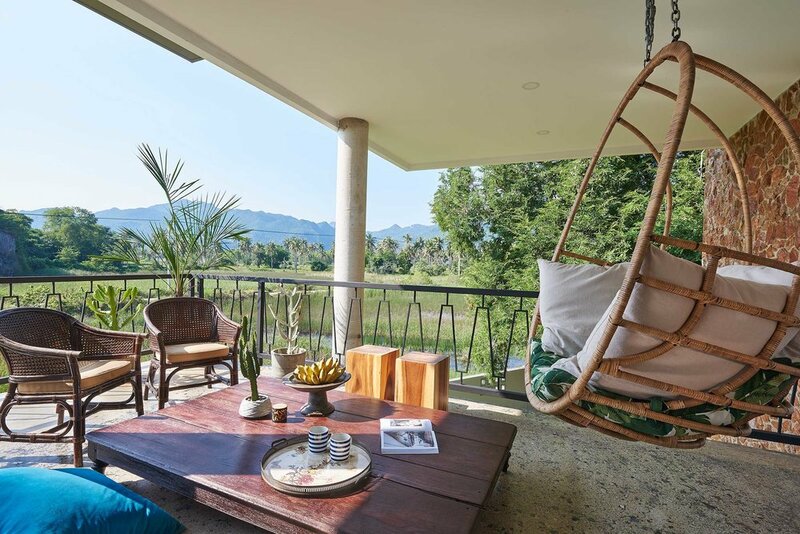 The space also includes a scenic rooftop pool and deck which boast a 240-degree view of the nearby Sam Roi Yod mountain and are a striking spot to watch the migrating birds. The poolside patio furniture and outdoor shower evoke a Palm Springs-style aesthetic, while a solid wood dining table and oriental armchairs feature inside. This Palm Springs aesthetic is continued in the home’s vibrant colourway, from the rich yellow of the stairway to the deep blue of the sofa and the red rock wall. Inexpensive, reddish-brown locally produced breeze blocks are used as walls throughout the house as well as on the south-facing exterior side of the building as protection from the sun. Terrazzo flooring, another mid-century modern signature, features throughout, while the building exterior uses a vibrant earth tone to stand out from but also echo the surrounding wetland. The designers based their materials palette on the overarching concept of bringing the outside in. Rocks commonly used in road construction and found in the nearby area were used to build impact walls throughout the house, which also complement the owner’s active outdoor lifestyle and fondness for entertaining. The furnishings add a particularly personal touch. The zigzag railing on the staircase is a direct replica of the staircase in the owner’s childhood home, while their collection of Thai and Scandinavian furniture effortlessly blend together. Even the kitchenware and home accessories evoke a time of yesteryear. The Rock House is a tropical ode to mid-century modern, blending childhood nostalgia with timeless and effortlessly cool design. Design Anthology is Asia’s premier interiors, design, architecture and urban living quarterly, published by Fifth Black Media in Hong Kong and available on newsstands globally.